If you’re planning a holiday to Thailand and you have kids then you absolutely must stay at the Villa Jasmine in Phuket. What makes this villa stand out from all the rest is its staff. When you have kids you need all the help you can get when you’re on holiday and this is where Villa Jasmine shines. Even before we left for our holiday, Brian, the owner was in touch with us making sure we would have everything we need – from stairgates to cots – we didn’t need to worry about a thing. He just wanted to make sure we had a “great holiday” and he meant it and we did. The villa is remarkable value. The price not only includes the luxurious and spacious accommodation but also the services of Noi, the incredible manager, Sia the lovely housekeeper, the chef and the pool man. This was truly a holiday like no other. We were thoroughly spoilt. If we felt like a massage, Sia would arrange for masseuses to come to our villa, if we needed formula or fancied some ice cream or spirits for our cocktails by the pool that night, Noi would go out and get groceries for us… Each night we would choose our meals for the next day from an extensive menu of delicious Thai and western food. We feasted like kings. You will be hard pressed to find fresher and tastier food in Phuket. The prawn cakes and chicken satay were to die for! The pad Thai was moorish. The curries were delightfully fragrant and as hot as you could handle. You could even go all out and order soft shell crab. We even ate fried rice out of pineapples. This was 5 star dining – in house! The best part – we didn’t have to lift a finger, except to gorge ourselves of course or take out an ice cold beer or soda from the fully stocked esky beside the pool. We had it so good in the villa that we had no reason to leave. And most days we didn’t! If it wasn’t for the convenience and comfort of the villa’s mini van and driver we probably wouldn’t have. 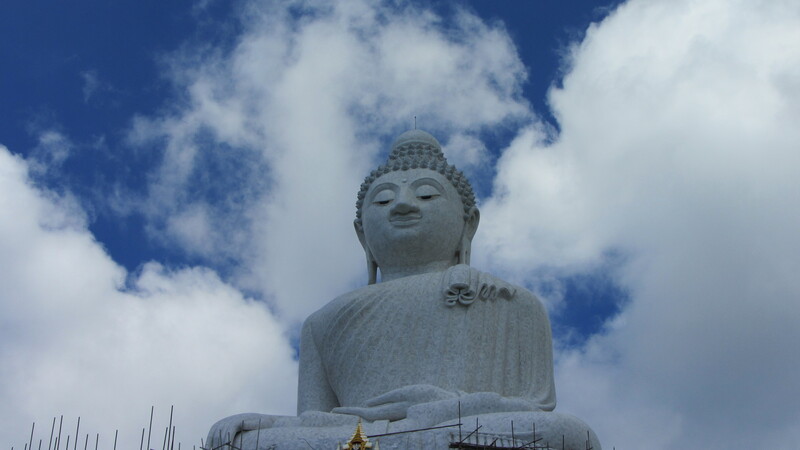 It seemed a shame however to come all the way to Thailand and not actually see any of Thailand so we bundled up the kids and set off for a day trip to see the Big Buddha and go elephant trekking. The kids had a ball. It was hot and tiring however so you can imagine how welcoming the villas pool looked when we got back ‘home’. 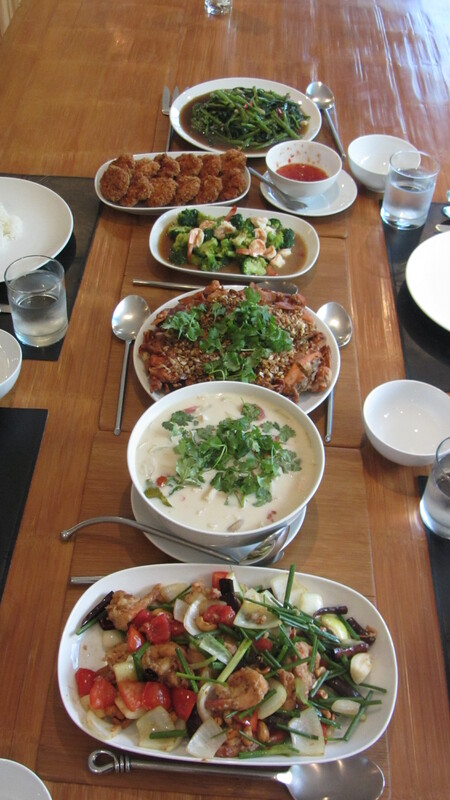 And how delighted we were to be treated to a delicious Thai meal that we didn’t have to cook or go out for. Now that’s what I call a holiday! You would think that we wouldn’t have had any privacy travelling with 2 families with 5 kids but we had plenty. The villa has 4 big bedrooms, the master being the largest which came with the biggest bathroom that I had ever seen. It could have been an extra bedroom! It had a huge spa bath which accommodated all 5 of our kids very happily at bath time. If ever we wanted any space we could hang outside by the pool while our friends watched tv in the loungeroom. There was plenty to keep the kids occupied too. The pool was perfect for young kids – the shallow pool was ideal for the under 2s. The main pool was sloping so my 4 year old could walk half the length of the pool with her head above the water giving her the confidence to actually go under water. In fact she taught herself to swim during our stay! When the kids got tired, there were plenty of DVDs to keep them entertained in the lounge. Happy kids = happy parents! The kids weren’t the only ones having fun. There was plenty to entertain us adults too. The villa was just 15 minutes away from the fantastic nightlife in Patong. A few nights Sia babysat for us while we adults got to hit Bangla and hang out in the bars listening to the live bands and dancing in the clubs. There were too many to choose from that we just had to keep coming back ! What could we do…?! Before we knew it our trip had come to an end. It was paradise, or as close as we could get it, with 5 kids under 5 on holiday. We had an amazing, truly relaxing, holiday. We couldn’t have wanted for more, except for a few extra nights of course! If you’re laden with kids and looking for some sun this Winter, then you really can’t go past the Villa Jasmine! I’m so glad we didn’t! This entry was posted in Holidays with Kids and tagged best villa with kids in phuket, child friendly phuket villa, luxury phuket villa, phuket, phuket holiday villa, villa jasmine. Bookmark the permalink. My staff and I are delighted that Stephanie and her family and friends enjoyed their holiday in Villa Jasmine. Thank you Stephanie for taking the time to write this testimonial and I apologise for only just realising I could respond to you on this forum. Best wishes and we hope to see you again . Brian Phillips (Owner).